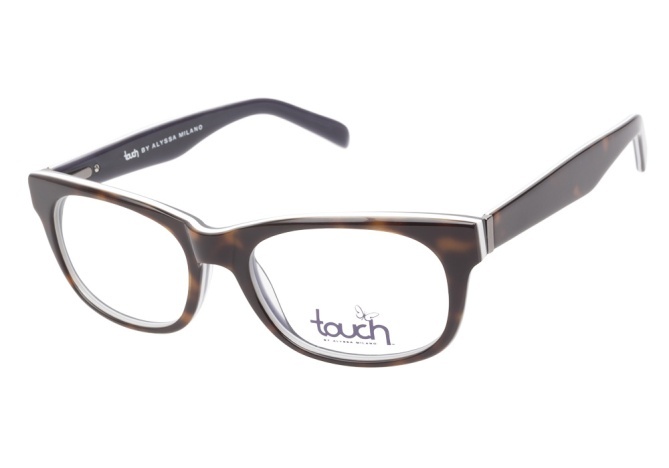 Now you can virtually try on these Touch eyeglasses by Alyssa Milano in a nice Demi white frame. Now you can see what you look like wearing these and you can do so easily now just using your webcam. See how you look today right now. Measurements Lens Width: 52mm Lens Height: 38mm Bridge Width: 18mm Arm Length: 145mm Details Touch by Alyssa Milano 109 Demi White Gender: Female Manufacturer: Touch by Alyssa Milano Material: Acetate Color: Demi White Spring Hinges: Yes Progressive Eligible: Yes Touch by Alyssa Milano 109 Demi White eyeglasses are elegantly laid-back. This contemporary style features a classic tortoise finish on the exterior with a hazy grey interior and a burst of white as the center layer. These glasses are simply accented by the thin silver hinges and a butterfly logo at the tip of the left temple. Try on these frames in the exact 109 style right here virtually online. ViewTry allows you to virtually try on all the Touch eyeglasses right here.